Biryani, biriani, or beriani is a set of rice-based foods made with spices, rice (usually basmati) and meat, fish, eggs or vegetables. The name is derived from the Persian word beryā(n) (بریان) which means "fried" or "roasted". 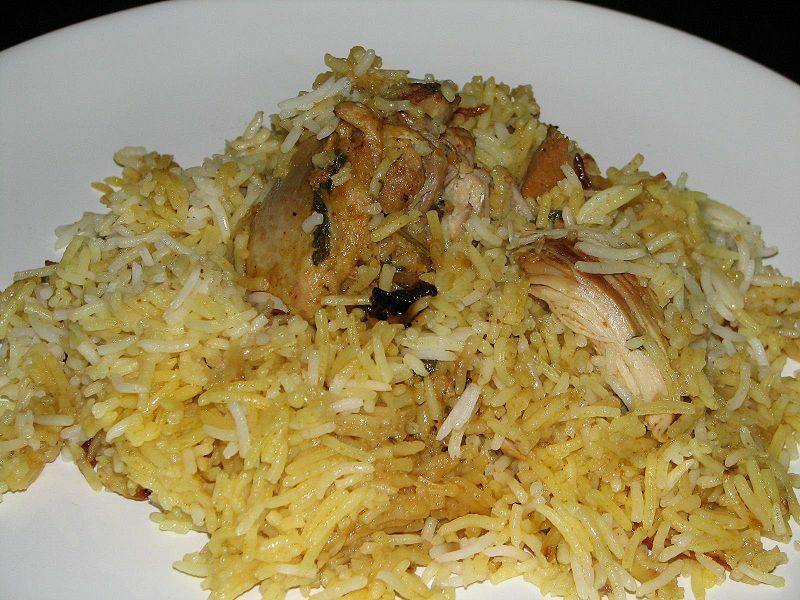 Biryani was brought to the Indian Subcontinent by Muslim travelers and merchants. Local variants of this dish are not only popular in South Asia but also in Arabia and within various Indian communities in Western countries. The spices and condiments used in biryani may include but are not limited to: ghee, peas, beans, cumin, cloves, cardamom, cinnamon, bay leaves, coriander and mint leaves, ginger, onions, and garlic. The premium varieties include saffron. For a non-vegetarian biryani, the main ingredient that accompanies the spices is the meat — beef, pork, chicken, goat, lamb, fish or shrimp. The dish may be served with dahi chutney or Raita, korma, curry, a sour dish of eggplant (brinjal) or a boiled egg. The difference between biryani and pilaf is that while pilaf may be made by cooking the items together, biryani is used to denote a dish where the rice is cooked separately from the other ingredients.